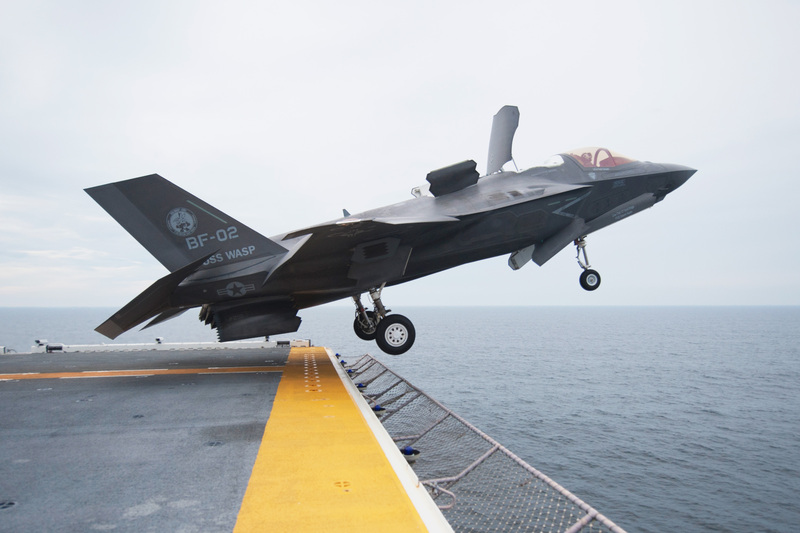 Carrier-borne fighters are a rare beast, with only the US boasting a sizeable force. Selection for a top ten was easy, as there’s barely ten types in total! The ordering of these types was a lot harder and to some extent subjective, though the winner is certainly an extraordinary aircraft. Strictly speaking, the F-35 doesn’t deserve a place on the list as it’s not yet operational, but as training has begun (and we’re short of an aircraft), we have included it. In time the F-35B and C will deserve separate entries. The next new naval fighter after the F-35 may be India’s equally long-delayed Tejas. 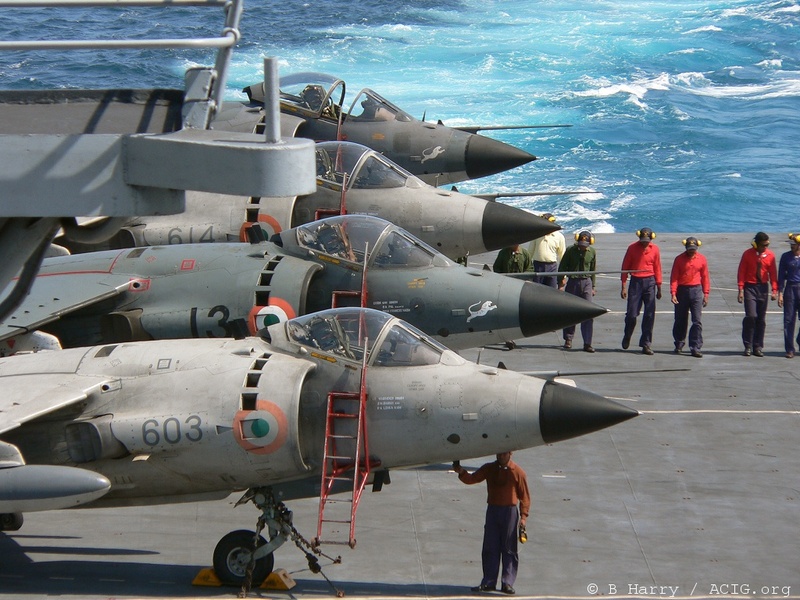 Indian’s aged Sea Harriers are not considered as capable as the FA.2s that Britain’s Royal Navy used to operate and of the thirty delivered only around eleven are still flying. However, the Limited Upgrade Sea Harrier (LUSH) upgrade gave aircraft the Elta EL/M-2032 radar and the potential to use the Rafael ‘Derby’ medium-range beyond visual range air-to-air missile. 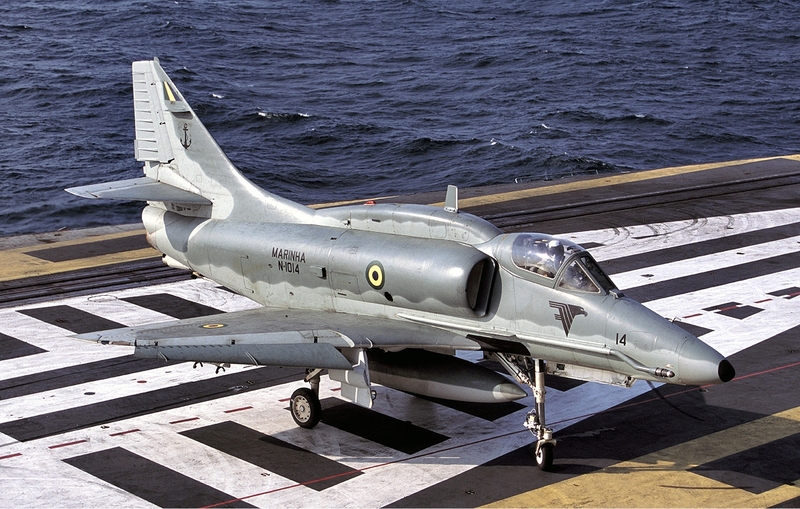 Brazil’s A-4s remain a viable aircraft despite the almost prehistoric airframe design. A host of promised, and in some cases, fulfilled upgrades have kept the beloved ‘Scooter‘ going on the deck of the Clemenceau-class aircraft carrier São Paulo. Long-promised weapons-options include the MAA-1B, Python 4 and Derby AAMS. Maybe one day they could be replaced by Sea Gripens. 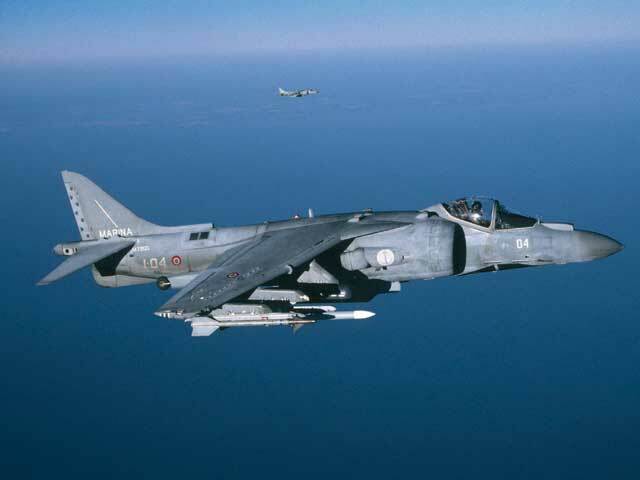 A mature platform with AMRAAM capability and a wide range of air-to-ground stores the modern Harrier is a well-equipped fighter-bomber that proved itself in the Close Air Support role in Afghanistan and the recce/attack/CAP roles over Libya. Sadly the Harrier is the most dangerous aircraft in US service with a shocking attrition rate that is around three times higher than the F/A-18. As well as a high attrition rate the type is considerably slower than most of it peers. The aircraft is operated by the USMC and the Italian and Spanish Navy. 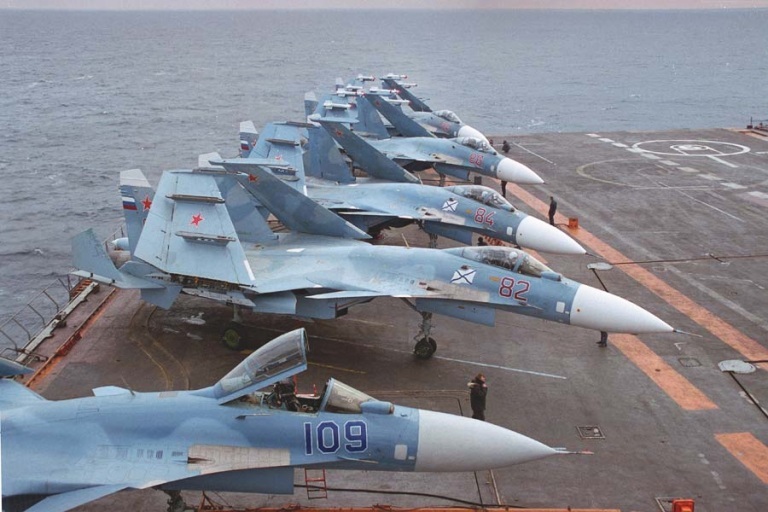 The Sukhoi Su-33 was intended to serve on Soviet aircraft carriers, however by the time it entered service the nation it had been developed to protect had disappeared. Only a small number were produced and were considered rather inflexible (with limited weapons options). Now their avionics suite is obsolete and they face the indignity (at least in Sukhoi’s eyes) of being replaced with the smaller MiG-29K. 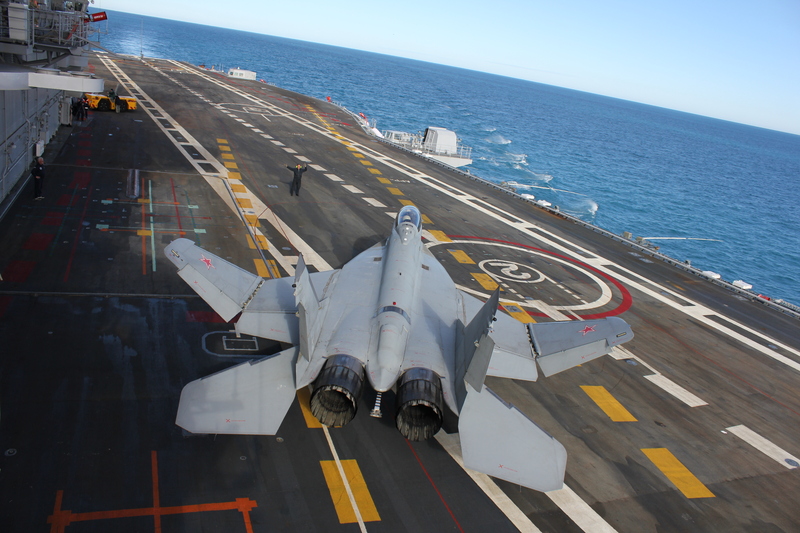 Though not yet mature, the Chinese navy’s pirate ‘Flanker’s promise to be formidable machines. 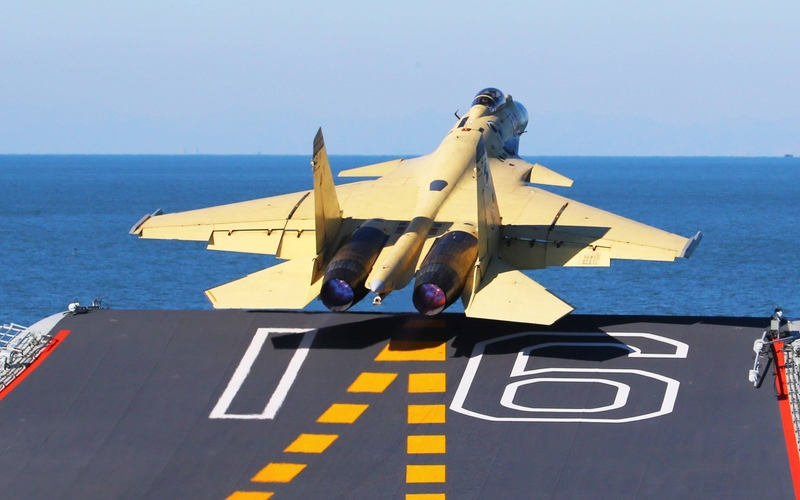 Utilising the best of China’s indigenously developed (and highly-respected) weapons and sensors the J-15 will be a sophisticated, agile and long-ranged fighter. 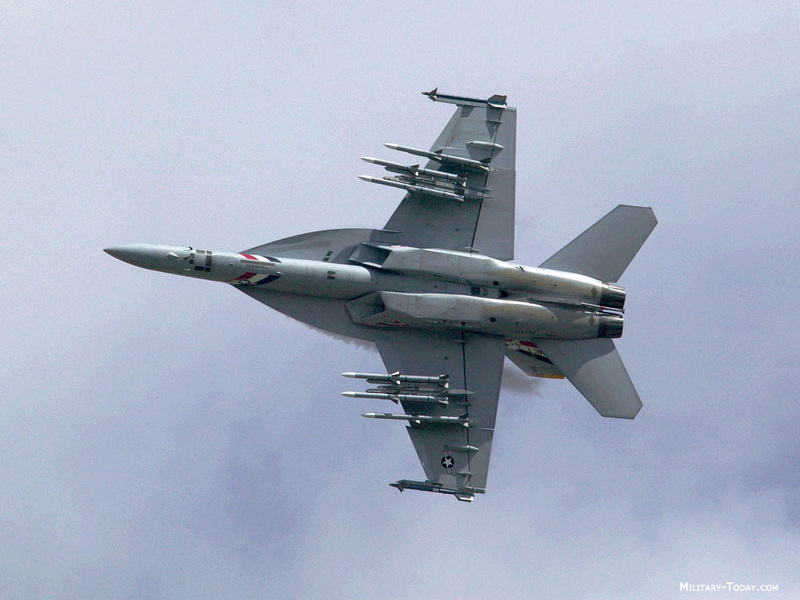 In terms of all-out performance, it will enjoy a significant advantage over the Hornet family in several respects, notably high altitude performance. The plucky ‘Bug’ is now in the twilight of its career. When it arrived on the scene in 1983 it was extremely advanced and trail-blazed many of the features that have since become de rigueur for fighters, especially in the field of cockpit design and multimode radar. It remains the fighter to beat at low altitude and is still held in awe as a dogfighter (according to pilots it has the edge on its larger brother in a ‘knife fight’). It was always short on range and struggled at the top right-hand corner of the performance envelope. The F/A-18 will be replaced in US Navy and USMC service by the F-35. When Russia selected the Su-33 for its carriers many thought it had gone for the wrong type as the smaller MiG-29 offered more versatility. A complicated saga ensued, made more complicated by the fall and then rise of the Russian economy, MiG’s precarious position and the Indian Navy’s order for the type. The MiG-29K is a world away from the original ‘Fulcrum’ in terms of range, pilot interface and sophistication and is one of the nastiest naval fighters to tangle with in the within-visual range merge. It is no slouch in the BVR regime either, with an advanced radar and the widely-feared R-77 ‘AMRAAMSKI’. 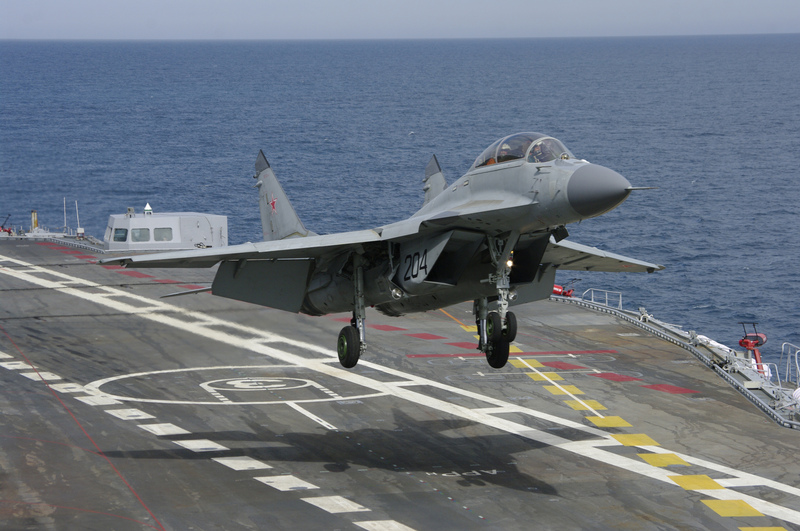 India has 45 on order (and has received more than 30), the Russian Navy has ordered 24. The Super Hornet rectified the legacy Bug’s main shortcomings of limited range and bring-back (the weight of stores that the aircraft can bring back to the carrier after a mission). It also featured radar cross section reduction measures which are rumoured to make it the stealthiest fighter (in terms of frontal cross section) this side of the F-22 (though Dassault may dispute this). The Super Hornet retains the ‘Turbo Nose’ of the Hornet (the almost uncanny ability to point the aircraft quickly and accurately). Though the APG-79 AESA radar of Block II aircraft has been plagued with unreliability issues, it was one of the first to offer simultaneous air and ground modes. The Super Hornet is fitted with some great kit and is compatible with a larger range of stores than any fighter on this list. Where it falls down is in its poor performance at higher altitudes and speed, where its relative lack of poke is an issue. Despite this, the Super Hornet has repeatedly proven its ability to rise to any challenges as a robust and reliable fighter-bomber. (All US Navy fighters are supported by the E-2D Advanced Hawkeye, a powerful force multiplier with a ‘stealth-busting’ UHF radar). Dassault’s Rafale is a masterpiece of aeronautical engineering. Despite being burdened with the additional weight of being a carrier fighter, it can mix it with the best fighters in the world (which it has demonstrated on exercises with the F-22 and Typhoon). In performance it is closely matched to the Typhoon, with the French fighter enjoying an advantage at lower altitudes. Few fighters excel at both the fighter and the bomber mission, the Rafale is a rare exception. 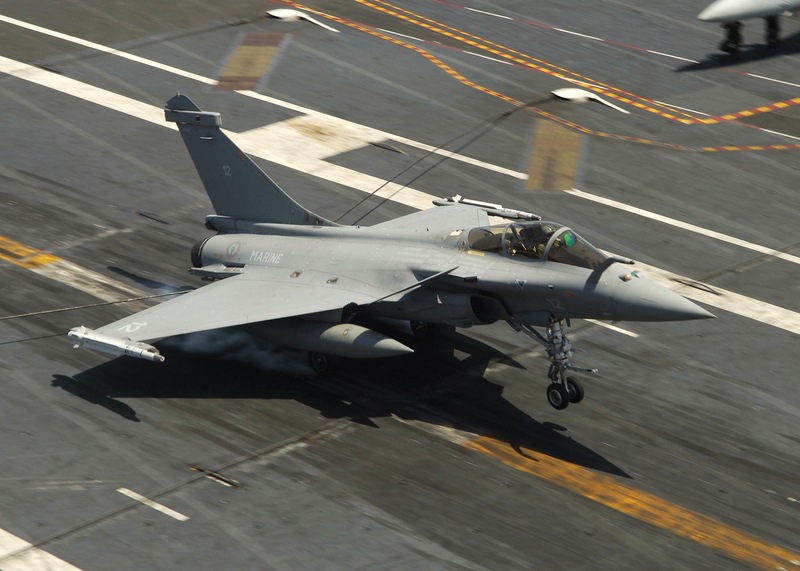 According to one test pilot the Rafale’s flight control system is unmatched in its responsiveness and precision (and markedly superior to the F-16) , an important consideration, especially for a carrier fighter. Defended by SPECTRA, which some regard as the best defensive aids suite in the world, guided by one of the world’s most sophisticated radars and well armed with weapons which include the most advanced aircraft cannon, the Rafale is the hottest naval fighter in the world. “Never fly the ‘A’ model of anything” expect amends to this article over the next few weeks. Are the rest of the “Top Tens” that us readers voted on a while back going to be coming soon? Yes- there’s a bit of a backlog, but they will all see the light of day. which one did you vote for? How can such a list not mention the Dassault Super-Etendard (and its latest version the “SEM”)? It’s not used in the fighter role. According to WIkipedia, it’s a “strike fighter” like other planes listed here (Hornet, Rafale) and it definitely had a fighter role before the Rafale was introduced. And it’s likely a better fighter than the Skyhawk or the Harrier? No F-14.. this list is invalid. F-35 approved to fly, but will it make Farnborough?